RCE GROUP USA, is a comprenhensive group in different fields of medicine, such as clinical aspects, education for posgraduated of medical carrers, pharmaceutical investigations, cosmetology and skin care, stemm cell aplications, and other fields. rce group usa under the leadership of Dr. Hugo Romeu, M.D. has the advantage that gathers under the same umbrella, with the necessary resources for conduct ing investigations in all aspects of any project related with the health’s field. RCE, is a conglomerate of different companies serving to the health’s fields for more than 25 years. “R” is for Research that means that we are devoted to the clinical and pharm aceut ical investigation, “C” is for “Clinical” and “E” is because “Education” in all this fields, we collaborate in the integral formation of the students and graduate of the different medicine schools. We help the different institutions to find all kind of laboratory tests, with a very high technology and quality control, serving between others, all the Phases of the pharmaceutical industry. The group of professionals that will do the job, will be highly qualified and they have a huge experience in this kind of tests. Ours laboratories show an average of 25 years experience. RCE Group USA is proud to announce a full service inpatient research unit based in Palm Springs Hospital in Hialeah. Our staff has 37 years experience in feasibility, Investigational New Drug Submission as well as protocol development. After 720 completed studies our database for recruitment far exceeds the clients expectations for subject enlistment. We are also ready to service late phase research projects. Pharm Rce is celebrating 6 years in the global market wholesale distribution. Our offices are in Merida, Yucatan, but our clients stretch across the globe. Please check for our special offers in Albumin and Neem. We are prepared to ship anywhere except USA and Canada. Take a look at our expanded catalogue of available products and see if you have a family member or acquaintance anywhere in Latin America in need of medicine, we will make sure they receive what they need. A pharmacy specialized in retail trade, quantities for the redistributors, export, import and online pharmacy. Dedicated mainly to the group of Mexicans that you/they need to send him/her in a quick and sure way some medications. For PharmRCE there is not you order big neit her small, our main objective is to serve to the community in its necessities of medical supplies. We are expert in international trades, export and import pharmacy products. It is a professional business born in 2017 with the purpose of providing services in the field of the health, the beauty, the loss of weight and the rejuvenation. A center equipped with high technology for the elimination of hair unwanted, treatments for the varicose veins, etc, under a strict care and a highly qualified personnel’s attention. 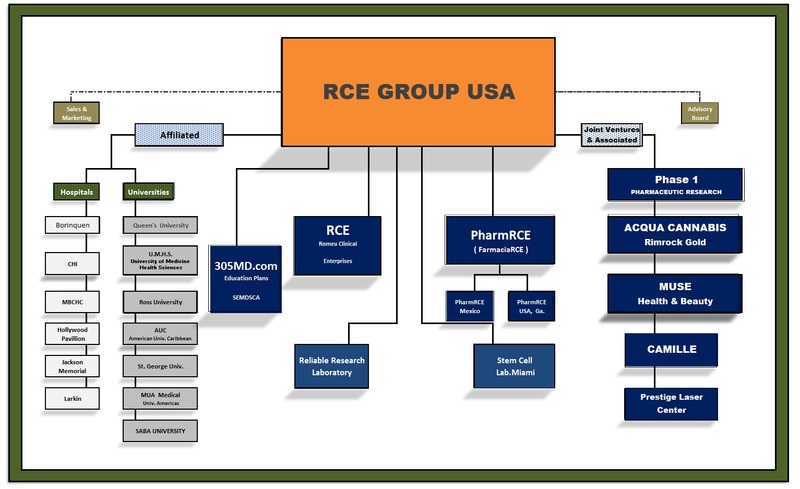 RCE GROUP USA, is envolved in the professional formation of students and graduate of the different schools of medicines, as much in the country as outside of this. Our purpose is to facilitate the necessary different rotations for obtaining of those but high accreditations like ACGME. Up to now they have gone by our trainings and rotations more than 1200 students and graduate of medicine. RCE Education has 23 years of Graduate Education Experience. Recently we have teemed up with Larkin Health System in Florida which has 2 Teaching Hospital and multispecialty stand alone Residency Training Programs. STEAM CELL LAB is a prived laboratory of stem cells that works as a team with a reliable investigation clinic. Our scientists has been working for more than 25 years to the service of establishments of health, primary and clinical treatments, besides the hospitals and of the pharmaceutical industry. We have completed more than 700 investigations in this field. “Legalize it, don’t criticize it;” in the words of the late Bob Marley song, has become a reality. Cannabis products are blooming into the legal market with a wide array of formulations and applications. The elaboration of Hemp derived CBD items are being utilized from pain and skin care, to the treatment of autism, appetite stimulation and much more. We are living in the age of new natural products derived plant based sources. Acqua Cannabis is a publicly traded wholly owned subsidiary of Rimrock Gold. As the COO and Board Member, Dr. Hugo Romeu will incorporate all of the resources and infrastructure of RCE GROUP USA to acquire new companies and clinically develop and test new CBD Hemp derived products. Over the last 20 years our team has been involved in the formulation, packaging, marketing and web design for several top selling beauty skin products. In addition we have participated in joint venture involving Derm Beauty Spas with all levels of treatment plans for rejuvenation; including but not limited to the branding of products distributed from each center. So we have decided to produce our own line of skin care with a whole new approach toward formulation and clinical use. The product “Camille” has two current formulas, one for daytime application, the other as an evening cream. For more information and free samples end us an email at info@rcegroupusa.com.